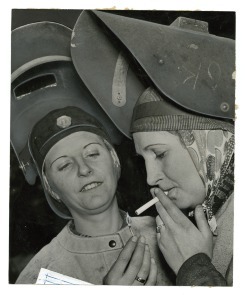 Time out for two Cramp workers: Stella Rea, left used to be a cigarmaker till she decided her place was on the munitions line. She and her sister went to school to learn welding. Mary Thomas is married to a Cramp leaderman. She's an air raid warden, and has an 11-year-old son. The Thomases manage at home by all pitching in to get the meals. She'd like to see more housekeepers turn to war work.